Gian Lorenzo Bernini had designed eight coats of arms of Pope Urban VIII in the Canopy of S. Pietro. 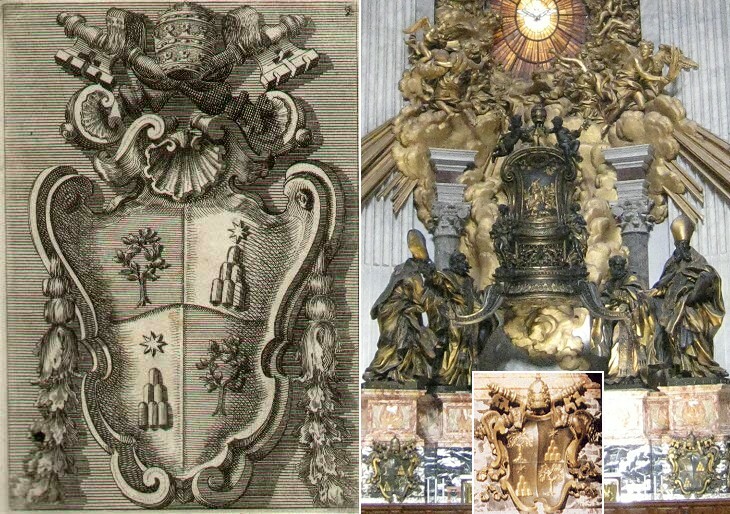 Pope Alexander VII satisfied himself with only four coats of arms by Bernini to celebrate the nearby Chair of St. Peter. The little shell shown by Juvarra in his drawing doesn't show up in the actual coat of arms. Note: Plate 41: unknown author - S. Pietro - Coat of arms of Gregory XIII (lost) can be seen in a page devoted to this pope.